Note: Indiana University East School of Nursing and Health Sciences is preparing highly-qualified nurses for today’s healthcare professions. This is the second story in a four-part series to feature how today’s faculty and alumni are working with nursing students to prepare for the future. Read the series online at iue.edu/nursingcommunity. Richmond, Ind. – Graduates say they’ve benefited from being able to learn nursing close to home, with opportunities in areas of care they’re passionate about, to serve their communities. Donald Day Jr., DNP, MSNL, RN, chief nursing officer and vice president of Patient Care Services for Fayette Regional Health System, said he his experience while a nursing student at IU East prepared him for graduate work and for a career. IU East nursing students travel to Chinle, Arizona, in the Navajo Nation, as well as Washington, D.C., Belize and many other areas to gain experience. IU East offers prospective nurses the opportunity to earn a Bachelor of Science in Nursing, or they can receive additional education locally to become a nurse practitioner. The university is preparing nurses to cover a variety of health care needs. It now has approximately 350 students between its undergraduate and graduate programs. The B.S.N. is available in Richmond, and the mobility option helping registered nurses earn their B.S.N. is offered in Lawrenceburg, Madison, Richmond and online. This past summer, IU East received full continuing accreditation for its B.S.N. program through 2025. Three tracks are available in IU East’s Master of Science in Nursing program: nursing education, nursing administration, and family nurse practitioner. Community collaboration also enhances the local program for undergraduates and graduate students. IU East has more than 60 clinical agency contracts. Amber Huelskamp, a 2018 B.S.N. graduate who now works at IU Health Ball Memorial, said she learned how to work alongside people from a variety of backgrounds during her service in the community. Tyler Evans, who earned a B.S.N. in 2013 and an M.S.N. in 2016 and works at Reid Health, said IU East students are very fortunate in the fact that nearly all of the resources needed are provided locally. He said that a lot of his clinical time was spent in the community. “I have grown up and worked in the same 20 miles my entire life, so knowing that I could learn and have opportunities here was a huge factor on where I am today professionally,” Evans said. Day remembers his community service experiences at Reid Hospital (now Reid Health) and through the IU East Center of Health Promotion. He and his classmates offered screenings for seniors through the Area 9 Agency on Aging (now LifeStream), from communities ranging from Fountain City to Brookville, Indiana. Rachel Rose, who earned her B.S.N. in 2011 and M.S.N. in 2016 and now works as a traveling nurse, said some of her best memories of her undergraduate degree include serving the Wayne County community. “My first clinicals were at a local nursing home. It was there that you could really begin to see how compassionate caring made all the difference,” Rose said. Rose also had clinicals at Richmond State Hospital, Reid and Centerville-Abington Community Schools, as well as opportunities in Indianapolis and Dayton. IU East School of Nursing and Health Sciences Dean Karen Clark said community collaboration is important, as it provides real-world opportunities for clinical decision making and creative problem solving. “As health care moves out of the hospital and there is a greater focus on population health, nurses will work in these venues providing both wellness and population health care at greater levels,” Clark said. One example of a community collaboration for IU East is Open Arms Ministries. OAM is a faith-based coalition of churches and other social ministries that provides a clearinghouse of need-based services in the greater Richmond area. Clark serves on the organization’s board and currently is its president, and Assistant Professor of Nursing LaDonna Dulemba has a background in rural health and serves on OAM’s homelessness committee. Senior nursing students complete community and/or leadership clinicals at OAM, learning how to case manage, use community resources, develop and implement programming. Through service learning outreach, IU East’s sophomores complete time at OAM assisting in resource management as they work toward their bachelor’s degrees. Another example of collaboration is student clinical placements in area schools. By working with school nurses and providing care to children where they are, Clark said IU East students increase their knowledge of health promotion, disease prevention, and disease management with the pediatric population often not seen in acute care environments. 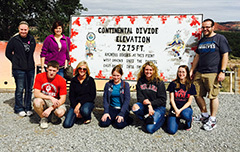 Beyond Wayne and surrounding counties, IU East students have opportunities to expand their skills around the world as well. Students are understanding the mission aspect of health care through the university’s travel experiences to places such as Chinle, Arizona, in the Navajo Nation, as well as Washington, D.C., England and Belize. Huelskamp went to Belize with a group from IU East, and said she is looking forward to returning to Belize soon to serve the people once again as a registered nurse. IU East nursing faculty are also receiving international recognition. Assistant Professor of Nursing Gloria Dixon and Dulemba were among those selected to present a 90-minute symposium at the Sigma Theta Tau International Research Congress in Melbourne, Australia, this summer. Part III of this four-part series will be published Tuesday, October 9. Read the series online at iue.edu/nursingcommunity.